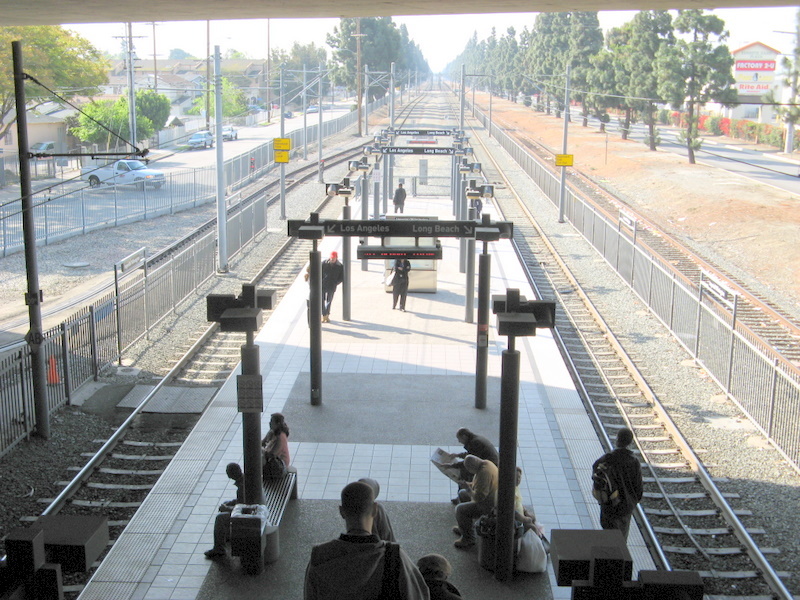 The Blue Line’s Willowbrook/Rosa Parks station. Photo by Sean_Marshall via Flickr creative commons. Earlier this month, from April 8 to 10, the Transit Bureau Service of the Los Angeles Sheriff’s Department began a new operational concept to improve safety on the Blue Line. The concept is called TRUST (Transit Rail Urban Saturation Team) and it consists of deputies saturating parts of the Blue Line and conducting conducting zero tolerance patrols on the trains and station platforms. It’s a combination of fare enforcement, train patrols, fixed posts for police and mobile, random foot patrols — and the LASD is saying more of these type of operations will be done in the future. During the three days that the operation took place: 895 citations were issued as well as 142 misdemeanor arrests and 11 felony arrests, according to the LASD. This initial iteration focused on the part of the line between the Firestone and Rosa Parks stations. “Our goal is to reduce the conditions that breed crime, disorder and insecurity. Operation TRUST is the first in a series of targeted enforcement efforts to improve security and enhance the riding experience for transit patrons and transit employees,” wrote the Sheriff’s Department in a news release. Each day 350,000 passengers ride the Metro Rail system in Los Angeles and 1.2 million passengers ride Metro Buses. The Los Angeles County Sheriff’s Department (LASD) is responsible for securing the Metro system and is committed to ensuring a low level of crime and disorder. Please remember, if you SEE SOMETHING that you believe is suspicious or doesn’t look right to you, SAY SOMETHING by calling: (888) 950-SAFE (7233), or your local police department. No Your out to give tickets to anyone and everyone possible so the department can make money and seem useful. and Instead they victimize the disable if they dont know the rules, perhaps thats why there disabled in the first place. if Metro has the money to hire Sheriff officers, then Metro should also clean up these stations more. The way the litter just piles up on the tracks and the smell of urine everywhere is exactly the problem that attracts criminals. Look up broken windows theory. That’s how former Mayor Rudy Giuliani cleaned up Times Square from being the cesspool of NYC where people stayed away from to becoming the most safest and liveliest place in NYC even during the night. What Metro needs to do is get get deep down and clean up the place. Then they need to add more bright lighting so that it makes people feel safer at any time of day. The place is dark even during the day. And once everything is done, they need a total re-modification of the station to keep the criminals from entering the station. Adding in spaces for shops should help too to liven up the otherwise cold concrete atmosphere. Oh please! When you se how much it costs to ride buses and trains in other metropolitan areas, Los Angeles’ system is a BARGAIN! Just because you don’t know the rules, doesn’t make you exempt from them. Look how many laws there are in the Vehicle Code. I will bet not one police officer knows them all! And, I know for a FACT that Metro posts their riding rules in plain sight on their buses and trains! Hang up your cell phone and pay attention!!! If you can’t read, ask! It’s about time! I look forward to, finally, seeing such operations clean up the Red Line, Green Line, as well. So far, Gold is paradise by comparison, but a few saturation ops on Gold should send the right message to those who think Gold is ripe for crime and problems. Only people who don’t pay the fare get a ticket. Im glad the sherriffs are finally patroling that area. Im tired of seing taggers and people who don’t pay their fare, it’s not fair for us who do pay. I’m glad to see this on the Blue Line! I would like to see this on a DAILY BASIS and especially at NIGHT! I have a monthly pass so I am good. If you don’t pay you deserve a ticket. If you went to McDonald’s they surely would not give you food without you giving them some money. Think about it. $84 for an EZ pass. Way cheaper than gas. Just very slow! Thank you for what the Sherff’s Dept is doing on the Blue Line. It is my hope this will become permanent. After riding the Blue Line since it opened and having to deal with teenagers selling candy, DVDs and cigarettes; all of which is banned on the Metro system it is about time. The Blue Line seemed like the Dump Line with all the solicitors riding the trains back and forth selling items for years without paying their fare. And for those of you on here that are complaining; this type of thing does not happen on public transportation in any other US city that I have ridden buses and trains. I think most people would agree that a little more law enforcement on the Blue Line is overdue, but I wonder if it can be done in a more community friendly way than having the County Sheriffs aka Stormtroopers brow-beat everyone into submission. How about sending some safety officers that you see more in downtown park areas riding bicycles? Thank You! Their presence has given the daily morning riders a pleasant and safe ride, however, please have more in the evening as that’s when the less desirable are on the train. I’ve only been riding for 1 year and would hate to convert back to an automobile because the Metro “Blue Line” can’t make the commute a clean, safer and with little delays. I have tried to convert co-works, however, when you have to explain the laws (Ins & Outs) of riding—this turns them off—you have to have a tough skin; it shouldn’t be this way! –Let’s Go Blue, I have faith it will turn around. I sure hope they found a way to get rid of those annoying, assertive, panhandlers, and “vendors” hawking, candy, water, bootleg DVD’s, etc. A Blue Line ride is difficult enough being the STANDING RIDE ONLY many trains are, without having to deal with people “hustling” illegal DVD’s, beverages, and candy! The best way to get rid of illegal vendors IMO, is to introduce legal vendors into the system. In my backpacking trips to Europe and Asia, I saw that its the actual shops inside the stations that keeps the place safe and secure. There’s always people around and it makes the place more lively. It keeps strangers away because criminals and thieves are out to look for places where there’s nothing around. The Metro stations in LA are just like that: there’s nothing around to keep the place safe and secure. I hope the LASD maintains their zero-tolerance, but walking around in “counter-terrorism” vest is not necessary. They are public servants, not public boogie men. Please make the trains an hoodlum-free zone.